Ever since the “If You Plant It, They Will Come” article was posted last week on the Blog, the bee-creature’s identity has been bugging me (pun intended). So, putting my Master Gardener research-based curiosity to work, I learned this isn’t a bee at all, but rather, a fly. The Toxomerus marginatus Hover Fly, or “Flower Fly,” is a common Hover Fly that frequents garden flowers and is a significant pollinator. These flies resemble bees and wasps because of their colored bands, but they do not bite or sting. Adults feed on the nectar from flowers, and the larva feed on aphids. You can find the adult flies feeding on alyssum, bachelor’s button, calendula, cosmos, dill, lavender, lemon balm, marigold, penstemon, parsley, yarrow, and zinnia. 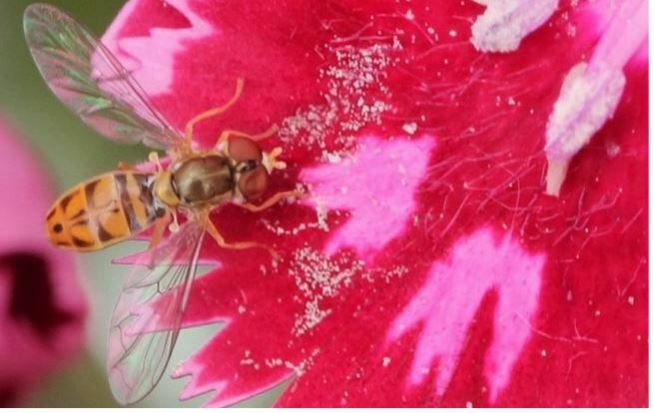 Note the pink and green iridescence of the wings, and the transparency of those wings that allows the jagged petals of the Dianthus to show right through the wings. I thought the image was worthy of another (closer) look since I did not notice these characteristics of the wings when I first shot the picture for use in the original “If you plant it….” article. Monroe Master Gardeners, convinced that gardens enrich our community, plan to showcase one private and three public gardens in a Saturday guided tour July 19 from 10am to 2pm. It will begin at the Demonstration Gardens at the MSU Extension building just south of the fairgrounds at 963 S. Raisinville Rd where Master Gardeners over the years have planted gardens for specific educational purposes. Adults will be charged $5 at that point and pick up a map to the remaining sites plus a free bottle of cold water. The proceeds will be used to train new Monroe Master Gardeners. That is a future goal since the class series has not been offered here since 2010. There is an outstanding children’s garden at that first stop with plants and garden features designed to delight children and to engage their senses of hearing, smell and touch as well as sight. A Monarch waystation has larval plants as well as many nectar sources to attract Monarchs and other butterflies. Plants to attract pollinators will be identified and a beekeeper will help answer questions about bees and other pollinators. There are native shrubs and a row of shrubs particularly adapted to heavy, low-lying clay soils common to the area. A rain garden, a large assortment of groundcovers including a fragrance garden with herbal knots and other theme gardens provide much to learn. Many plants will be labeled and volunteers will be on hand to identify and explain. The president of the local Master Gardener Association will also open his large private garden along the river where he has developed an extensive collection of native plants and carefully designed areas to maximize garden interest and enjoyment throughout the season. He will share his long experience with various ornamental grasses and show which ones are both hardy and non-invasive. The other two gardens, also close to the river and west of Monroe, are local treasures that even people who use the public areas tend to ignore. When tour participants reach those stops they will find Master Gardener volunteers eager to point out the value of special plants and both landscape and vegetable gardening techniques to lower maintenance and increase gardening rewards. Get a carload of beginning or experienced gardeners and children together to enjoy this summer experience! Cost: Adults $5. Children 12 and under, free. Favorite things in the Extension garden by Karen Bender. This time of year one of my favorite things is enjoying the beautiful fall colors. We are particularly blessed with a wonderful fall display at the Extension gardens. Many of the trees and shrubs are four season winners and it has been great to see these seasons in real specimens, not just photos in the garden catalogs. The gardens have also made it possible to continue planning for another favorite thing, watching birds in the winter. While bird feeders brings the birds in, planting fruit and seed bearing shrubs and trees help sustain more birds (and other critters) as their preferred choice of food for many species. It has been a joy to monitor blue bird nesting activates through the summer but I hear their song throughout the winter and want to encourage them to stay around. The cornus group is used by many birds, including blue birds, because of its high fat content which helps sustain them through the winter. What a beautiful example of a Dogwood tree we have in the hummingbird garden! Cornus sericea, Redstemmed Dogwood, Gray Dogwood, Red-osier and Silky Dogwood are bird favorites and such beautiful berries for us to view & enjoy over the winter. Another group of multi-seasonal interest is the Viburnum group. How can you beat spring flowers, fall colors and berries for the birds? One early spring I was surprised while on my deck to see a Cedar Wax Wing hop on the railing, give me a glance, dive into my Holly bush and emerge with a bright red holly berry, one of their favorite foods as they migrate further north in the spring. (Did you get a look at the Extension gardens’ Ilex? It’s a stunner! Last year I planted a Serviceberry and a Black Chokeberry. I am hoping they will add variety to yard banquet landscape plan. This year has been amazing abundance for most Malus species groups. While it may appear that the crab apples are not being used as they hang on but after several freezes, the tart flavor becomes more palatable to our flying friends. I continued to watch my tree through the winter and thought that was the wrong variety of flowering crab but by the spring, Robins were a frequent visitor and soon the tree was empty. Julie Zickefoose, a writer and nature artist, has explained that sometimes the only sustaining food left near the early spring is Sumac. If you have a spot in your plan for Sumac, wild grape, Virginia Creeper, Poison Ivy (only in a remote area), Pokeberry and other native fruit bearers, you will be helping to sustain many species of birds . Don’t forget leaving out squash seeds and fruit seeds like apple and unused table grapes.